Over the past year, we have posted a number of short blogs in which we have discussed issues that careful proposal writers should try to avoid in order to be entirely accurate in communicating information. In other words, we are committed to the concept that applicants should “Say exactly what they mean, and mean exactly what they say.” There are several reasons for doing this. First, it can help to avoid communicating the wrong idea to reviewers, which is, of course, never a good idea for applicants looking to receive positive reviews. The second reason is that practicing such good habits in a grant proposal will avoid the possibility that those reviewers with a solid command of the English language will end up focusing on irrelevant issues related to English grammar, rather than the actual (and infinitely more important) ideas being presented. Today, we’ll focus on arguments that applicants frequently put forth as to the value of the new knowledge that is expected to have been created once the work has been completed. 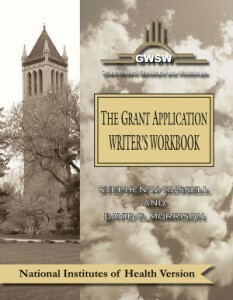 This is, of course, an issue that is strongly stressed in The Grant Application Writer’s Workbook (all versions). Not only is it critically important that a reviewer fully appreciate the underlying problem that will serve as the driving force for the application and why addressing this problem would be of value to the funding agency, but a reviewer must also buy into the proposed strategy the applicant will use to pursue the idea and achieve a successful outcome. However, many applicants (unfortunately) forget that, equally important to the above is a discussion of what the actual “deliverables” are expected to be (and not “will be” since there are never any guarantees of a successful outcome in any research project). This is where the applicant has the opportunity to tell the reviewers what they expect to be able to “give back” to the funding agency in exchange for the finances that have been provided to do the work. In essence, it is an opportunity to provide to the reviewers with the underlying “quid pro quo” that would serve to justify the funding agency supporting the project. There are several key errors that applicants frequently make in discussing what the expectations will be once the work has been completed. The first is that many applicants simply provide a recapitulation of the work that has been described earlier in the application. As an example, it is very common to write, “Our expectation in this project is that we will determine the key factors responsible for development of this condition. We will also describe how each of these factors can be targeted in order to prevent development of this condition.” If you were to think carefully about this, you would immediately see that these statements are not significantly different than the (hopefully) earlier-stated objective in this application (since both the objective and what is written above are written in the future verb tense). To avoid this type of error, use of the future perfect tense of “determine” and “describe” would always be the preferable strategy. For example: “At the completion of the proposed project, it is our expectation that we will have determined the key factors responsible… as well as “to have provided appropriate strategies for how to prevent development of this condition”. A second error that is relatively common derives from making the assumption that the necessary outcome of the successful completion of the work will (necessarily) transform the field with respect to the problem being addressed. For example, following up on the example above, it is not unusual to follow the second sentence “…in order to prevent development of this condition.” with: “This new knowledge is expected to (not will) transform the way that people with this condition are treated, ultimately leading to its eradication as a significant human problem.” While this is certainly likely to be a fervent wish of the applicant (who is, of course, often seeking fame and fortune), it is highly likely to be a faulty argument. Even assuming that the applicant’s idea does lead to the development of a strategy to prevent people from experiencing the described condition, and assuming that the work is appropriately published in a relevant journal, there is no valid basis for the assumption that anyone will necessarily pay any attention to the publication. In other words, even if a solution to the problem exists, if that solution is ignored, it will literally be impossible to transform the way that people with a risk of developing this condition are treated. (Consider, for example, the fact that Edward Jenner self-published his report on cowpox variolation procedures –“vaccination”- as a strategy to prevent smallpox, yet this did not become common practice for more than a century.) As a consequence, the best that an applicant can argue is that: “This new knowledge has the potential to transform the way that people at risk of developing this condition are treated…” or “This new knowledge can be expected to provide new opportunities to transform the way that people with a predisposition for this condition are treated…”. A third problem is to over-anticipate the results that the new knowledge will have generated. Returning to the above example, an overly ambitious applicant might decide to ignore a discussion of the actual, realizable deliverables and, instead, promise that: ”Our expectation in this project is that, at its successful completion, we will have successfully prevented this condition from serving as a threat to the 10% of the population susceptible to it.” This would be a prototype case of overpromising and underdelivering; never a good idea in a grant application! The bottom line here is that, while a discussion of expected outcomes at the completion of the project is an essential skill of the successful proposal writer, there are a variety of issues that have the potential to undo those efforts, that the applicant must be careful to avoid.